This is only one part of a larger picture. 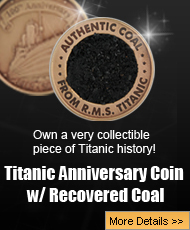 For more information, please read Investigating The Titanic Conspiracy and The James Cameron Conspiracy. Do you still remember the Hollywood block-buster movie film TITANIC with actor Leonardo de Caprio? Well, it is not the real story or perhaps just a part of the story. What you’ll read below is the true story as to what really happened to the famous ship called Titanic. The information you’ll read below is not a conspiracy theory, but rather well-recorded in the books of World History. The sinking of the Titanic has always been an event surrounded by a great deal of mystery. Elements that led up to the eventual demise of the ‘unsinkable’ vessel have been questioned and analyzed for nearly 100 years. 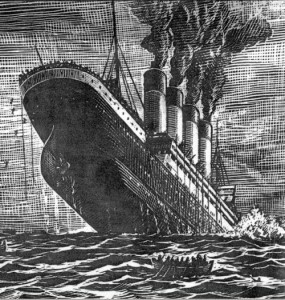 Many believe that fate brought the maiden voyage of the Titanic to an end, others believe that reckless tactics throughout the voyage played the primary role in her sinking, and others still believe that the Titanic tragedy was brought upon by much more sinister events. One of many Titanic conspiracies floating around, many believe that the sinking of the famous vessel was well planned, well executed, and orchestrated shape the world as we know it today. This is the Federal Reserve Titanic conspiracy. Less well known: the Titanic’s flare guns fired white flares. Red was (and is) the emergency standard. Other colors were used for identification (white = White Star Line). When the Titanic was sinking, her crew fired her flare guns. The Californian and other ships saw the white flares, but didn’t consider them a distress call. At one point, the Californian, commanded by Captain Lord, may have been as close as six miles to the stricken vessel. 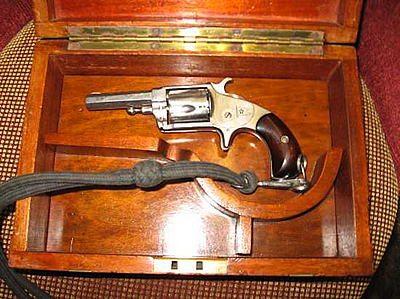 According to other websites, the box containing this gun was the box taken off the Titanic by one of the ship’s crew on that fateful April night. The box contained . . . an unused flare gun. Clearly, the Five Shot, 33 Pinfire Derringer Revolver here does NOT fit this case. What happened to the Titanic’s flare gun contained therein? It was most probably destroyed as part of White Star Line’s cover-up of the failures leading to the disaster. Someone kept the box for decades. Did they keep the flare gun? All three men, whom were opposed to the Federal Reserve, died during the sinking of the Titanic. The Federal Reserve is installed as part of the Federal Reserve act in December of 1913, roughly a year and eight months after the Titanic tragedy, and World War I less than a year later. Theorists believe that the Federal Reserve and the Jesuits were responsible for funding the United States, Germany, and Russia in the war. How can u guys say that stuff, I have grown up learning about the titanic. One. But i plan kn letting the titance not go down in vain. Knows the titanic as she was not a killing steam ship. Uh…huh. The Olympic/Titanic switcheroo theory is more plausible than that. And the BoT standard for emergency signals was “any rocket of ANY COLOR” fired one at a time, as Lord Mersey and the committee even read out to Stanley Lord, trying to see if he was REALLY admitting to either not knowing what a distress signal was or knowing and not doing anything about it. It was a switcharoo, sailed purposely into an iceburg by the Jesuit Edward Smith. The weakened hull merely made the ship more prone to damage and accelerated the sinking. With Bunkers Aflame, Officers Were Compelled to Race for Port. of the stokers on the ship who was rescued. He declares that Captain Smith and his officers knew of this fire, but kept it secret. highest speed was maintained on this account. Dilley was one of 150 survivors of the Titanic crew who were [?] back to England today on board the Red Star liner Lapland. You smoke way too much crack to make sense. Please don’t write things any more because it’s an embarrassment to the human race. our sheer unwillingness to learn anything new or be open to possibilities you hadn’t considered before is proof of your ignorance. I honestly think that the Titanic – unlikely that it was swapped – has some dark and mysterious link to it. There has to be. Why else would the surviving crew members be held (for 24 hours after returning to England) in a small railway shed-type-thing and sworn to secrecy – if nothing dodgy was going on? Why else would a third (I think it was) of the boilermen etc quit their jobs before the maiden voyage DURING THE MIDDLE OF A COAL STRIKE and DURING THE TIME WHEN PEOPLE NEEDED JOBS. They wouldn’t just suddenly up sticks and leave a ship without SOMETHING BIG going on. We need evidence. We need some kind of explanation for the growing similarities in the two sister ships Olympic and Titanic. Otherwise, it leads people with no other option but to come up with conspiracy theories. The ‘switching ships’ theory isn’t recent. It has been around for as long as the Titanic has. It may be ridiculed but there is some truth to it. Think of the Californian, think of the crew. Think of how long it took them to start filling the lifeboats, to first send out the first SOS/CQD message, think of how many people quit their jobs, how similar the ships were. Just think. And even if our imaginations take us way beyond the truth, at least it’s more interesting then some ship being sunk by a bloody iceberg near New York. No offence is intended to any relatives etc. of Titanic passengers who didn’t make it/did survive. But you have to take all this into account. We don’t get high on coming up with these theories. We just want it to all make sense. No one will ever know the truth. It’s best just to leave it at its original facts and move on. Everyone is considered wrong bc there is no significant proof. What a load of rubbish! 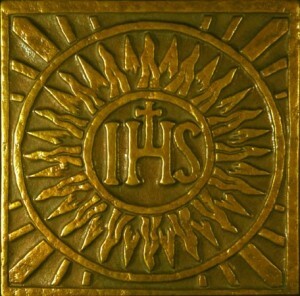 Even if the Jesuits were anything to do with the Federal Reserve, which they are not, then that certainly does not connect them to the Titanic or to the owners. Why would they want to kill people on board the ship that also carried many Irish Catholic families to America? If the people mentioned were in danger as they were on the Titanic as she sunk, they are among the first class who are more likely to get a place in a life boat. In fact the Strauss couple refused to leave each other as Mr Strauss would have been separated under the sea rule of women first, so it was choice and not murder that led to their deaths. Surely, the Titanic according to the main conspiracy was the victim of switch with the Olympic for insurance fraud and the accident was meant to be staged so as all the passengers got off and it just all went wrong? 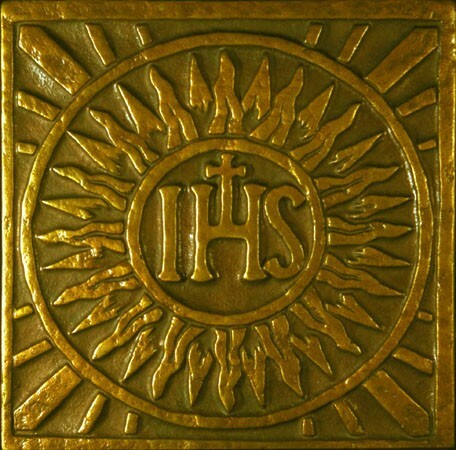 This negates the writers reasoning that it was a Jesuit plot to stop rivals from opening a new bank. Total rubbish! This is just another 21st century piece of anti Catholic propaganda. Not to mention that their are no such organisation as the Illuminati. This is pure fiction. The insurance money JP Morgan claimed/collected from the sinking of the Titanic was the actual seed money he used to make the Federal Reserve possible. He used the blood money from the cold blooded murder/sacrifice of all on board the Titanic to move forward on the Illuminati plan for a New World Order. All the US currency in circulation is tainted by the sin of its creation. Its all blood money to start with. This makes sense. Why didn’t Capt. Smith call an S.O.S. before midnight, when ships were still listening? Also J.F.K. was going to get rid of the Fed. Reserve and go back to true money. Look what happened to him.